^ a b c d e f g h i j k l m Rosenfeld, RM; Piccirillo, JF; Chandrasekhar, SS; Brook, I; Ashok Kumar, K; Kramper, M; Orlandi, RR; Palmer, JN et al. (April 2015). “Clinical practice guideline (update): adult sinusitis executive summary.”. Otolaryngology—head and neck surgery: official journal of American Academy of Otolaryngology-Head and Neck Surgery 152 (4): 598–609. doi:10.1177/0194599815574247. PMID 25833927. ^ Adkinson, N. Franklin (2014). Middleton's allergy: principles and practice (Eight ed.). Philadelphia: Elsevier Saunders. p. 687. ISBN 9780323085939. オリジナルの2016-06-03時点によるアーカイブ。. https://books.google.com/books?id=vT9YAQAAQBAJ&pg=PA687. ^ Hamilos DL (October 2011). “Chronic rhinosinusitis: epidemiology and medical management”. The Journal of Allergy and Clinical Immunology 128 (4): 693–707; quiz 708–9. doi:10.1016/j.jaci.2011.08.004. PMID 21890184. ^ King, D; Mitchell, B; Williams, CP; Spurling, GK (20 April 2015). “Saline nasal irrigation for acute upper respiratory tract infections.”. The Cochrane Database of Systematic Reviews 4: CD006821. doi:10.1002/14651858.CD006821.pub3. PMID 25892369. http://espace.library.uq.edu.au/view/UQ:201653/UQ201653_OA.pdf. 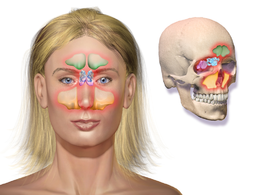 ^ “The diagnosis and management of acute and chronic sinusitis”. Primary care 35 (1): 11–24, v–vi. (March 2008). doi:10.1016/j.pop.2007.09.002. PMID 18206715. Chow, Anthony W.; Benninger, Michael S.; Brook, Itzhak; Brozek, Jan L.; Goldstein, Ellie J. C.; Hicks, Lauri A.; Pankey, George A.; Seleznick, Mitchel et al. (2012). “IDSA Clinical Practice Guideline for Acute Bacterial Rhinosinusitis in Children and Adults”. Clinical Infectious Diseases 54 (8): e72–e112. doi:[[doi:10.1093%2Fcid%2Fcis370%7D|10.1093/cid/cis370}]]. ISSN 1058-4838.